Condition your work attire for maximum comfort with our exclusive women’s under scrub tops. Each top is composed of lightweight material and provides a streamlined silhouette that easily fits under any outer apparel. The super soft polyester material is completely breathable and moisture-wicking, allowing for effective temperature regulation throughout your workday. Each women’s long-sleeved t-shirt under scrub is also anti-microbial, wrinkle-resistant, wear-resistant, and thoughtfully designed to be perfect both for layering and as a solo piece. Our women’s under scrub tops are engineered for your comfort, so you can focus on attending to the comfort of your patients. 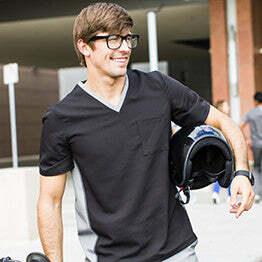 Choose our women’s long-sleeved t-shirt under scrubs for a difference that you’ll feel all workday long.